No final do ano passado a Heidi, do blog canadiano Elegance and Elephants, convidou-me para participar na sua nova série: Roots. O desafio desta série era criar algo baseado nas nossas raízes. Uma ideia gira, não é? Desde que recebi o convite, não tive dúvidas sobre qual seria a minha inspiração. Parte da minha família é minhota e, como a minha avó adorava costurar (dizem que saio a ela! ), fez-nos uma série de fatos de lavradeira que usávamos nas férias do verão. Os fatos são espantosos pelo detalhe, pela conjugação das cores e tecidos mas também pela sImplicidade e autenticidade. Last year my friend Heidi - from the Canadian blog Elegance and Elephants - invited me to participate in her new series: Roots. This series’ challenge was to create an original outfit inspired by our background. Great idea, isn’t it? Since I received the invitation, I had no doubts about what my inspiration would be. 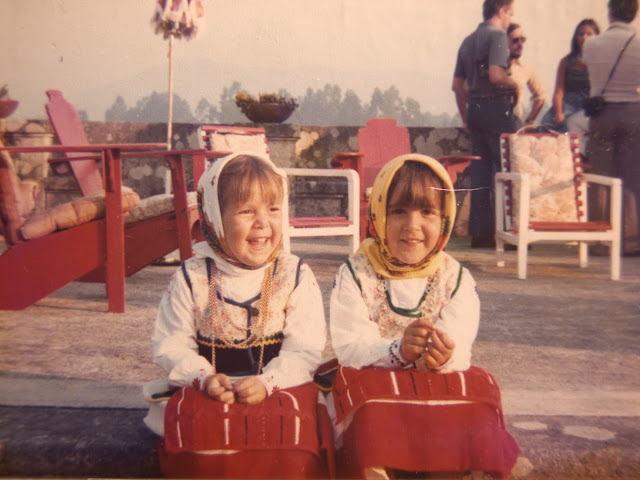 Part of my family is from Minho (a beautiful province in the northwest of Portugal) and, as my grandmother loved to sew, she made us several traditional costumes we used to wear to the summertime festivities. These costumes are quite impressive for its details, fabrics and color combination but also for its simplicity and authenticity. Lembro-me de acharmos imensa graça ao bolso lateral, a algibeira, e esse foi o ponto de partida da saia que fiz para a Teresa. I remember we loved that funny shaped side pocket so I decided it would be the starting point of my Root’s creation. Lembro-me ainda que a dita algibeira tinha que estar 1/3 escondida pelo avental por isso, em vez de um avental, fiz uma saia de traçar. A realidade é que esta é uma “falsa” saia de traçar porque o cós de elástico é fixo. Nada mais simples e fácil de usar. O bolso foi, tal como eu previa, um sucesso! É perfeito para guardar os berlindes que a Teresa leva e trás da escola! Entretanto resolvi ainda fazer um colete, já que essa também é uma peça fundamental do traje original. O molde é o mesmo dos pijamas do Natal mas tirei-lhe as mangas, fi-lo um pouco mais curto (para não tapar o bolso, claro!) e, na frente, usei botões em vez de fitas. Como escolhi uma fazenda de lã bastante grossa como tecido principal, resolvi não fazer bainhas e rematar tudo com ponto zig-zag. Adorei esta técnica! Fácil e rápida mas eficaz e gira. 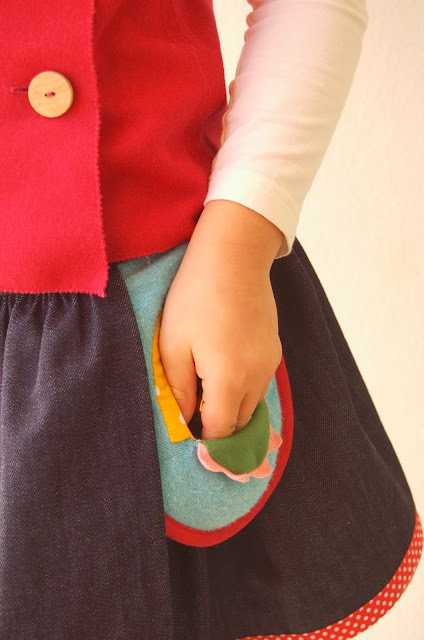 I also remember my grandmother telling us that the pocket should always be 1/3 hidden by the apron. So I made a very simple skirt with a side pocket attached. 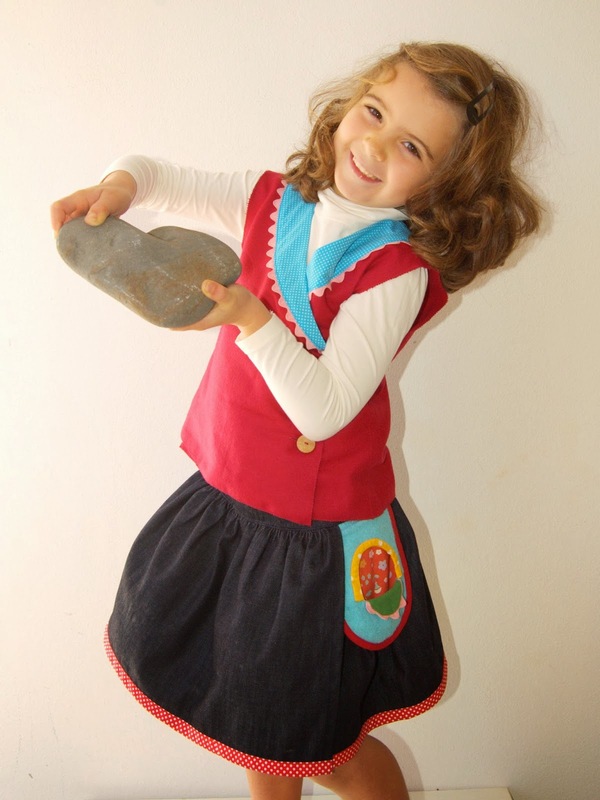 Instead of adding an apron, the skirt overlaps a bit at the front in order to hide the side pocket. But the waistband is a basic elastic waistband. As simple and easy to wear as it can be! Teresa, as I predicted, love that colorful side pocket! 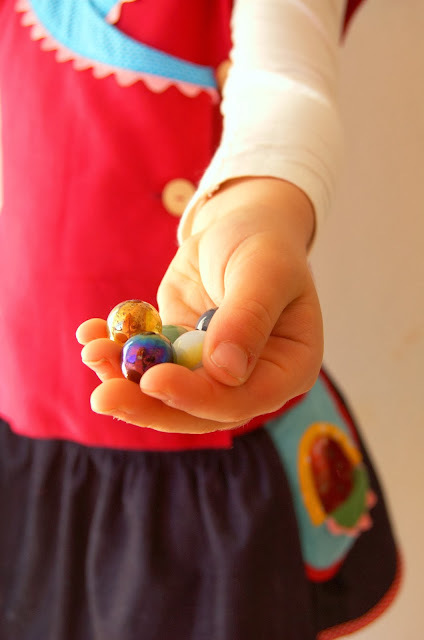 It was perfect for keeping the marbles she takes to school every day! After finishing the skirt I decided to make matching a vest, since this is also a fundamental part of the original costume. The pattern is self draft and it is the same I used for this year’s Christmas Pajamas. The changes to the “original” pajama pattern were simple: no sleeves, a little shorter in length (not to cover the pocket, of course) and, at the front buttons instead of ribbon ties. Since the main fabric is a thick wool fabric, I decided to finish all raw edges with a simple zigzag stitch instead of making real hems. I have to tell you I am in loved this technique! 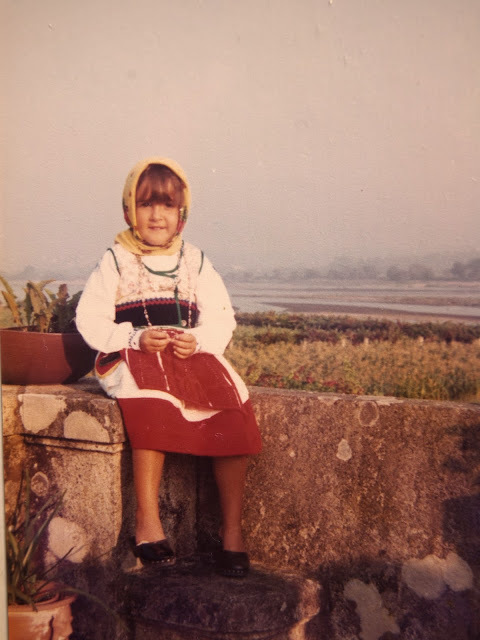 Fiquei muito orgulhosa da minha velhinha máquina de costura (uma Pfaff dos anos 60 herdada da minha outra avó) que costurou 6 camadas (2 delas franzidas) de ganga duríssima sem pestanejar! Nada como uma máquina em ferro! Por alguma razão não gosto de ver as minhas filhas totalmente vestidas com roupa feita em casa por isso acho que estas duas peças vão ser muito mais usadas separadamente. A saia com uma t-shirt de algodão colorida e o colete com uns calções ou calças de ganga básicos. I am very proud of my very old sewing machine, a Pfaff from the 60’ I inherited from my grandmother. In order to finish the skirt’s waistband, I had to sew 6 layers (2 of them gathered) of thick denim. And she did it without a blink! There is nothing like an old metal sewing machine! 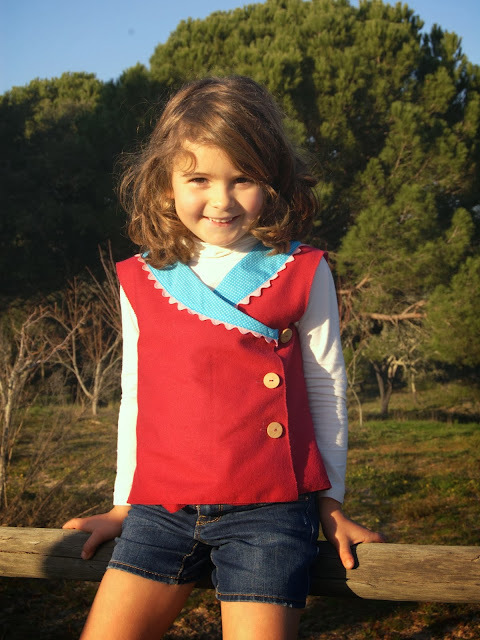 For some reason I do not like to see my daughters fully dressed in homemade clothes so I think these two pieces will get much more use separately. I will match the skirt with a colorful cotton tee and vest will be worn with basic shorts or jeans. Passem pelo blog Elegance & Elephants nos próximos dias e vejam as criações de bloggers de todo o mundo. 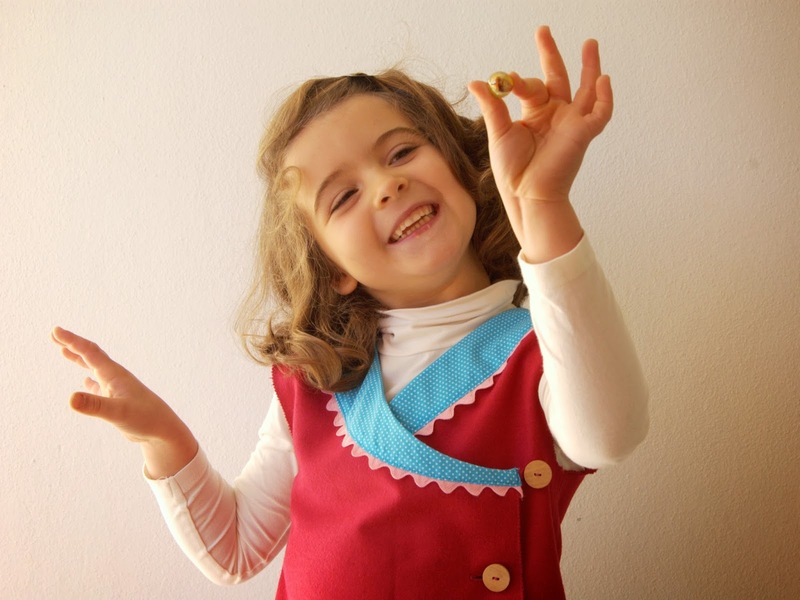 E, já agora, participem no sew along que a Heidi está a organizar porque os prémios são incríveis! Check out Elegance & Elephants in the coming days and take a look at the creations of some bloggers from all over the world. And don’t forget to add a photo of your roots inspired outfit to Heidi’s sew along contest as the prizes are awesome! OH, sooooo beautiful, Marta! And vintage-inspired, too! As always, your attention to detail amazes me…that pocket…WOW! 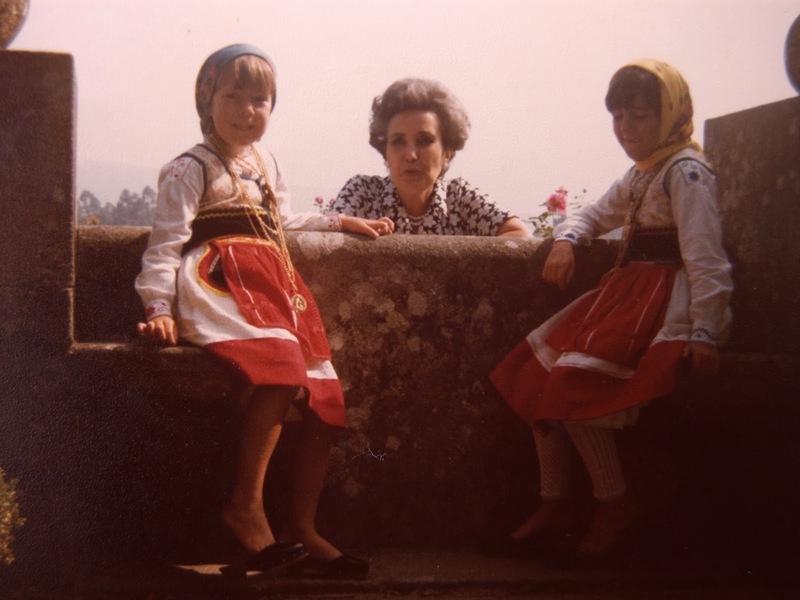 Those photos of you, your sister, and grandmother are so precious, too. Thank you so much for sharing more of your culture with us! Marta - what a beautiful outfit! I love hearing about your grandmother as well - how special! So beautiful Marta! I love your fresh spin on a traditional outfit. The versatility is icing on the cake. The colors are beautiful as well. Thanks for sharing! Beautiful attention to detail, and I love the pocket especially! I may try your approach of finishing the edges of a wool garment with a zig zag stitch on a skirt I am planning for myself! Oh wow, such a great idea & I love your grandmother's abilities to pass your heritage onto you. This outfit is so lovely! You get the traditional feel with a modern vibe...perfect! Marta, amazing!!! I love love love this outfit!!! 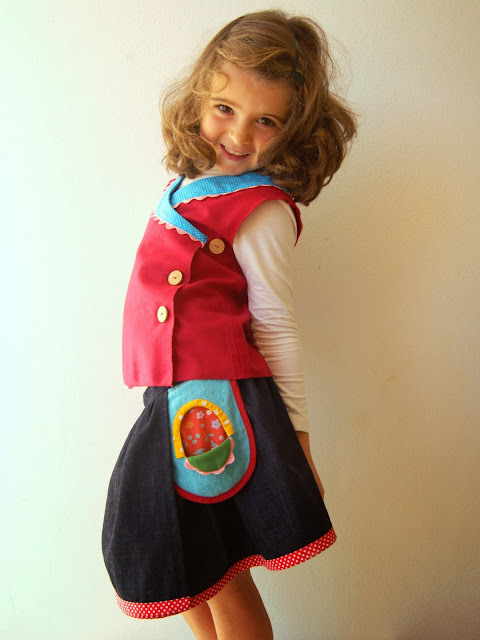 That side pocket is so sweet... wow, fantastic job on this outfit! And I really appreciate the backstory too... your grandmother would be so proud!!! Your creation turned out so playful, youthful and cheerful! I enjoyed reading your story. Marta! This is beautiful! I love how you incorporated your culture into an everyday outfit. The pockets takes the cake! That pocket is just perfect. What a lovely nod to a beautiful tradition. And I like the idea of incorporating them as separates too. I loved your creation. 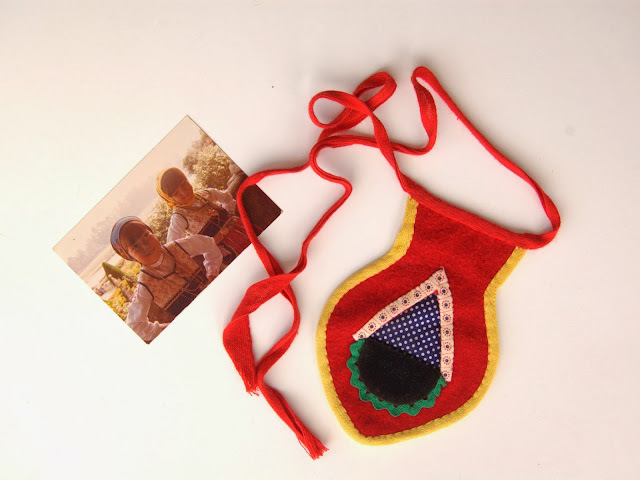 Especially the very colourful pocket and the tradition behind it. It reminds me of similar traditions in this part of the world. That's amazing, Marta. I love every detail of your creation, and the pictures too! I'm working on a dress for my post, my I hope it will be as beautiful as yours! Nem imaginas como eu adorava os fatos de minhotas quando era nova (ainda adoro, mas em criança era mesmo uma locura): as cores, os brilhos dos colares eram o máximo! Adorei a tua versão! Os bolsos são o máximo, mas o conjunto (mesmo usado em separado) está fantástico! Wonderful way to update a tradition! Thank so much for all your comments! I've been so busy these last few weeks I completely forgot to say thank you to all of you! It means a lot to me that this specific outfit was such a great success. I still have to show it to my grandmother. I think she will be really proud.